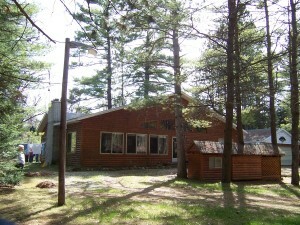 This log sided home on the scenic AuSable River has 100 ft. of frontage near McMasters Bridge! The property itself contains majestic pines in a very private setting. The ranch style home has 3 bedrooms, 1 1/2 baths, oak kitchen cabinets, walk-in closet in master bedroom, 2 fireplaces, 1 1/2 car garage, stairs to the river and a 12x16 storage shed.